Email: Thanks to everyone who wrote in about the maps. This page has had nearly a million hits since the election and I've received so much email that I may not be able to reply to everyone, but I much appreciate all your comments and suggestions. Many of the things people have been asking about are answered in this list of frequently asked questions. Book of cartograms: I have a new book of world cartograms entitled The Atlas of the Real World, coauthored with Daniel Dorling and Anna Barford. It's nothing to do with elections, but it contains more than 300 cartograms showing everything from who emits the most greenhouse gases to who imports the most fish. You can see a preview of some of the maps here. The book is supposed to be fun but also informative – the maps are a great way to learn many things about the world that you probably never knew. If you're interested in this stuff check it out. I have new cartograms of the 2016 election results. You can find them here. The states are colored red or blue to indicate whether a majority of their voters voted for the Republican candidate, John McCain, or the Democratic candidate, Barack Obama, respectively. Looking at this map it gives the impression that the Republicans won the election handily, since there is rather more red on the map than there is blue. In fact, however, the reverse is true – the Democrats won by a substantial margin. The explanation for this apparent paradox, as pointed out by many people, is that the map fails to take account of the population distribution. It fails to allow for the fact that the population of the red states is on average significantly lower than that of the blue ones. The blue may be small in area, but they represent a large number of voters, which is what matters in an election. As you can see, the states have been stretched and squashed, some of them substantially, to give them the appropriate sizes, though it's done in such a way as to preserve the general appearance of the map, so far as that's possible. 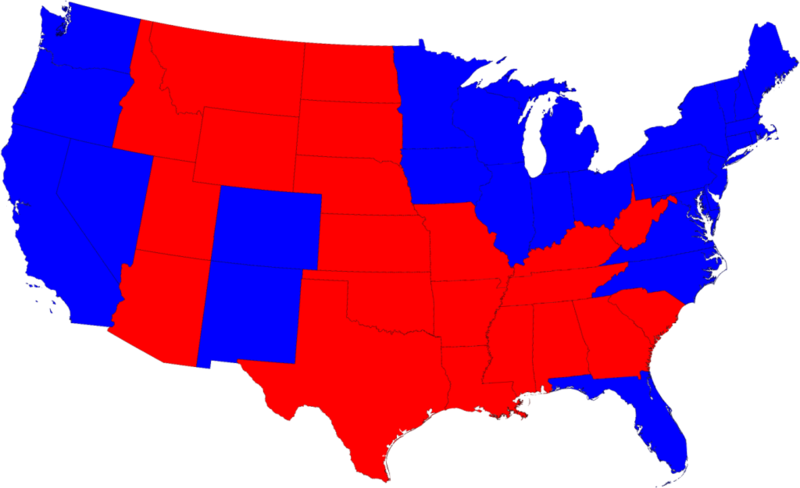 On this map there is now clearly more blue than red. The presidential election, however, is not actually decided on the basis of the number of people who vote for each candidate but on the basis of the electoral college. 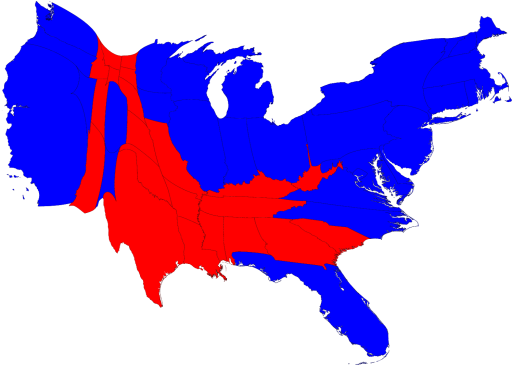 Under the US electoral system, each state in the union contributes a certain number of electors to the electoral college, who vote according to the majority in their state. The candidate receiving a majority of the votes in the electoral college wins the election. The electors are apportioned roughly according to states' populations, as measured by the census, but with a small but deliberate bias in favor of smaller states. This cartogram looks similar to the one above it, but it's not identical. Wyoming, for instance, has approximately doubled in size, precisely because of the bias in favor of small states. The areas of red and blue on the cartogram are now proportional to the actual numbers of electoral votes won by each candidate. Thus this map shows at a glance both which states went to which candidate and which candidate won more electoral college votes – something that you cannot tell easily from the normal election-night red and blue map. However, this map is still somewhat misleading because we have colored every county either red or blue, as if every voter voted the same way. 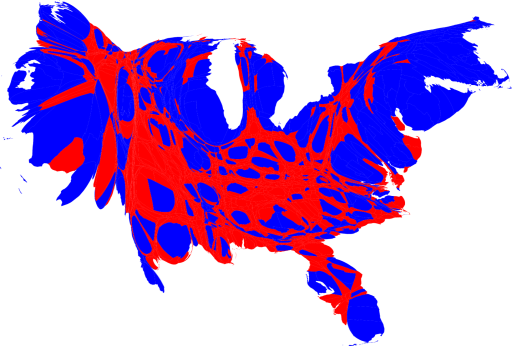 This is of course not realistic: all counties contain both Republican and Democratic supporters and in using just the two colors on our map we lose any information about the balance between them. There is no way to tell whether a particular county went strongly for one candidate or the other or whether it was relatively evenly split. As this map makes clear, large portions of the country are quite evenly divided, appearing in various shades of purple, although a number of strongly Democratic (blue) areas are visible too, mostly in the larger cities. There are also some strongly Republican areas, but most of them have relatively small populations and hence appear quite small on this map. These maps use a color scale that ranges from red for 70% Republican or more, to blue for 70% Democrat or more. This is sort of practical, since there aren't many counties outside that range anyway, but to some extent it also obscures the true balance of red and blue. Frequently asked questions (FAQs): A list of frequently asked questions concerning these maps, along with answers, can be found here. County results: The county-level data I used came from here. For those who want to do their own analysis, here are spreadsheets of the complete county results in OpenDocument and Microsoft format. They are up-to-date as of November 16, 2008, but a small number of precincts still had not reported by that date, so a few results are missing. Correction: Vote tallies for Richmond and Kings counties in New York were mistakenly interchanged on the original maps. This has now been corrected on all maps. Many thanks to C. Moore for pointing out the error. Poster: A wall poster of these maps, made by the University of Minnesota, can be downloaded here. Software: My computer software for producing cartograms is freely available here. This work is licensed under a Creative Commons License. Text and images may be freely distributed. I'd appreciate hearing from you if you make use of them. The views expressed are personal and are not necessarily shared by the University of Michigan.